CRESTWOOD, Ky.  William Cullina has a passion for plants. 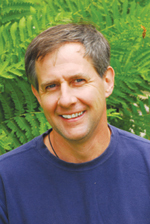 He has traveled extensively studying and photographing plants and will bring his impressive volume of knowledge to Yew Dell Gardens for a wildflower lecture. Cullina, an internationally renowned wildflower grower, photographer and writer, on March 7 will present Fabulous Wildflowers! at Yew Dell Gardens. The event is scheduled from 10 a.m. to 11:30 a.m. The lecture will focus on native plants, while weaving in ecology, design, cultural elements and stories, said Cullina, 44. Lecture participants will learn about the diversity of wildflowers in the eastern forest and tricks on cultivation in the garden, said Paul Cappiello, executive director of Yew Dell Gardens. Cullina, originally from Connecticut, holds degrees in plant science and psychology. He is a past director of horticultural research for the New England Wild Flower Societys Garden in the Woods and Nasami Farm, the largest retail native plant nursery in New England. He left this job to pursue a position as plant and garden curator for the Coastal Maine Botanical Gardens, one of North Americas newest public gardens. The gardens feature 250 acres of forests and gardens along a mile of salt water in Boothbay, Maine. The Coastal Maine Botanical Gardens opened two years ago. Cullina is responsible for developing the gardens, collections, interpretation and overall helping it to grow, he said. Cullina lectures extensively to garden and professional groups, similar to the program he will present at Yew Dell Gardens. He is a frequent contributor to popular publications and trade journals. His fifth book, "Understanding Perennials," is expected to be for sale soon. It is not an encyclopedia, cautions Cullina. Rather he would have readers think of it as an owners manual. The book answers such questions as: "What makes plants drought-tolerant?" And it focuses on topics such as stems, leaves, flowers and propagation. We try to bring in speakers who are experts in their field and who present in a manner that engages the audience, said Karla Drover, assistant director of Yew Dell Gardens. Cullina lives on Southport Island, Maine, with his wife, Melissa, 6-year-old son, Liam, and 1-year-old twins, Ronan and Maeve.  Cost for the William Cullina lecture is $15 for members and $25 for non-members. For more information, call Yew Dell Gardens at (502) 241- 4788 or visit: www.yewdellgardens.org.